Life can be hard. What an understatement. Day after day, the waves of life crash upon us – relationships, work, school, family, community obligations, finances, health issues, fears, worries, anxieties…never ending. For awhile, we can keep our heads above the commotion, but just barely. Like a duck swimming on a lake, what appears calm from the surface is nothing more than a charade as he kicks frantically under the water. In these times of desperation, we find ourselves fighting to latch on tighter to the things we believe we can control, the very things pulling us farther under the waves. Fear and anxiety are debilitating and slowly we begin losing the battle to stay afloat. As I was driving to church this morning I heard an analogy that spoke to me. God wants to be our spiritual life jacket, our ONLY life jacket. Too many times people cling tightly to work or friends or money. These things can too easily slip though our fingers, leaving us feeling alone and utterly exhausted in the waves of life. ONLY when God wraps his loving, protective arms around us can we fight less fervently to stay afloat, He is there to support us in our times of weakness and exhaustion. Lean on Him and find your rest. Trust that even in the middle of the chaos, God will be there to keep you a float. I must have really needed this message today, because our worship band sang about it, too. If you haven’t heard Not Afraid by Jesus Culture, listen to it immediately. God isn’t looking for perfect people, He loves us just as we are, right now. For 2019 I have chosen Brave as my word of the year. I want to become more brave in all areas of my life – my walk with God included. As someone who likes to plan and be in control, relinquishing that to God has proven to be difficult for me in the past. I see now that I was refusing to accept Him as my life jacket. I am making a conscious effort to bravely trust that God has a plan for my life, especially if it is different than my “plan.” For many years I tried to do it alone, and wound up exhausted and utterly spent emotionally. It’s time to give it all to God – there’s nothing to fear because He is my spiritual life jacket. Spring is a time of change. The snow melts. The days start to get longer. The trees bloom and the flowers awaken. And in no time at all, there will be butterflies. I’ve always been fascinated with butterflies, not because of their colors or their grace, but because of the amount of change they endure in such a short lifetime. Within the span of a-couple-months, a Monarch butterfly will hatch from an egg, spend its days consuming leaves as a larvae (caterpillar), attach itself to the stem of a plant or branch as the pupa (while it undergoes 10 days of change in the chrysalis), until it finally emerges as an adult butterfly with mere weeks left to lay an egg to ensure the survival of the species before passing away. Change does not come easy to me – it never has, and it doesn’t matter how big or small a change may be, it causes me to over think, over analyze and over worry. I would be a terrible butterfly. I’ve hatched from an egg all alone in the world. Is this plant I’m on safe to eat? What if my chrysalis detaches during a storm? Will I be strong enough to break out of this thing when it’s time? How will my wings know how to fly without being taught? What if I fall? Now I have to produce the next generation – that’s a lot of pressure! It’s a really good thing I’m not a butterfly – I may have never made it out of the egg! Just like the butterfly, I find myself in a season of change. I am taking steps to return to school to further my education, a goal I set for myself when I watched my mom graduate with her Master’s degree, the first in her family and the best role model I could have ever asked for. Scott and I are also apartment hunting. Together we’ve looked at two apartment layouts at one complex, he looked at a different complex today before work, and I’ll look it over on Saturday. I’m ready to have our own place, but I find myself on a rollercoaster of emotions from excitement to totally terrified. More often than not these days, I wake with knots in my stomach and a pounding headache after nights of stressful dreams. I know I’m worried about finances and finding an apartment that is clean and in a safe neighborhood. But I’m also worried about me. Living in Florida for a year while on the Disney College Program was one thing, I knew when it ended I would be returning home, to my room, to my safe haven. Now, that’s not an option. I don’t know who I am outside of these blue bedroom walls – they have been my sanctuary since I was 10 years old (but I should mention that when we built this house I was all about the pink frilly life, so the walls were baby doll pink). This room has seen me change from pre-teen to an adult woman. I have slammed the door after arguments with my parents, shared my deepest, darkest secrets with friends, and cried my heart out in here when a boy carelessly broke my heart. This room has seen many late nights finishing homework or finishing a book that I just couldn’t put down. I do my best thinking and writing from this spot on my bed, staring out the window at the post office and the great void beyond. My room has changed with me, always adapting to my needs. From pink to blue, from Barbie dolls to mountains of mystery and romance books, and my embarrassing love of Billy Gilman to my new love of running races. But as I look around, I notice how the room doesn’t feel as big as it once did. Maybe that’s because I share it now. Most of Scott’s belongings aren’t even in here, they are sitting in our front room downstairs waiting for a place to call home. Or maybe it’s because, like the butterfly who knows when 10 days have past and it’s time to emerge, I know the time has come to move on. I doubt the butterfly ever thinks about what happens to the chrysalis it left behind. I, on the other hand, think about a time when this room will no longer be “my room.” One of my sisters will move in here. They have always shared a room and have been chomping at the bit for me to pick up and leave already. I can’t blame them, it is nice having a space all your own in the house. Whomever moves in will change the walls, redecorate and add her own personal touch to the space. I will be erased. Just a memory of yesterday. My safe haven claimed by someone new. It may be silly to feel so attached to a room, but we are each unique and have our own quirks. Maybe you are attached to a specific coffee mug, car or jacket. Called it an adult version of a security blanket, it’s that one thing you can count on being there to pick you up and warm your heart. And soon, I will be walking away from mine. I think I will feel lost for a while, unsure of my footing in my new room. But I hope with time I will feel comfortable there. Change is never easy, but in order to progress through life it is a necessary evil. And so it is at these late hours of the night I find myself praying that my wings will know how to fly because whether I want to or not, I’m changing into a butterfly. Do you live for change or does every cell in your body fight for things to remain as they always have like me? Tell me your best tips and advice for surviving a season of change! I don’t know how many more rough nights and anxiety starting mornings I can take. Last weekend, Scott and I had the chance to spend two and a half days with his family in Chicago celebrating the upcoming wedding of his younger sister, Abbey. After a six and a half hour drive through two states that started at 6:45 a.m. Friday morning, and a (terrifying, for me) journey on the Chicago Skyway, we’d arrived. Thankfully Scott was driving when we hit the city because 1. They are crazy drivers coming at you from every which way and 2. It was necessary that I take as many photos as the bumpy road would allow since the only other time I had been to Chicago, I’d flown, and it was an overcast day, which blocked the beauty of the skyline. But before seeing family, being the hungry-driven travelers we were, we made a quick stop for food at Portillo’s. This was only my second time eating there, and it was just as delicious as I remembered. You MUST try the beef and cheddar croissant… as Scott once told me, it’s something you cannot visit chicago without trying. Once our bellies were full, there was no rest for the weary! After quick hugs and hellos, we were put to work, the reason for this trip after all! After hair and a yummy dinner, it was on to cutting purple tulle and decorative ribbon to decorate balloons at Saturday’s bridal shower, followed by folding invitations while Abbey and her mom addressed the envelopes. With three of us folding (Dan, Scott and myself) it took no time at all! And not long after that it was thankfully time to hit the hay, I mean pillow! Saturday morning started with Scott and his mom arranging a sweet photo collage of Abbey and Dan that included baby photos and pictures of the happy couple through the years! I loved seeing all the old photos! Then it was off to Party City to pick up some special balloons and then off we went to the church to decorate! The room turned out lovely decked out in purple and silver, the wedding colors, and Abbey’s mom did an amazing job arranging cupcakes to look like a wedding dress! The shower was a blast – she received many lovely gifts and we all had a wonderful time laughing and talking. I felt so at ease and at home and comfortable with these people, which was so special for me as it was only the second time I’ve been around Scott’s family, and he wasn’t even with me at the shower, because, ahh-hem, no men allowed, minus the groom of course. Before we go any farther, yes, we have talked about it, yes, it will happen someday, no, I don’t know when that will be, no, we aren’t already secretly engaged, and yes, I have thought about what that special day will look like, what girl hasn’t?! Now that we have that out in the open, I love knowing that his relatives are excited about me joining their family one day! And to answer one of their questions, I have thought about it, a lot actually, over the years, and it’s entertaining to me to see how my mental picture of that day has changed since I was a little girl. As we’ve kept it no secret, Scott and I met while working at Walt Disney World in 2010, so naturally, people expect us to have an EPIC Disney wedding. Take a quick look at my Pinterest album, and you’ll see all the parts and pieces of a fairy tale wedding are there waiting to come to life! Bet you can’t tell what my favorite Disney movie and Princess is….anyways, the Disney ideas are endless! There’s the overall Disney wedding, the themed attraction wedding, or limiting it to the specific locations we’ve worked, or limiting it still to Disney’s Animal Kingdom since that’s were we met! The cake could even be “dino themed” since we were working at Dinoland all those years ago! Or maybe, we recreate our first date and do an EPCOT themed wedding with all the countries represented! How fun would that be! Of course there would be hidden Mickey’s everywhere and how about Dole Whips for everyone, one of our favorite Disney treats! And thank goodness there are sites like Paperless Post that provide dozens of invitation ideas – browsing quickly I found these two which screamed Cinderella and Beauty and the Beast! And of course, they also offer the option to create a style using your own photos, what’s not to love about that?! As you can see, so many fun ideas out there should we decide to go the Disney route when it’s our turn to plan a wedding. The only thing I know for sure that I want Scott to be the one standing at the end of the aisle waiting for me to get to his side. Nothing else matters, not the month, colors, theme or the cake. Just the two of us madly in love ready to start living our own happily ever after. 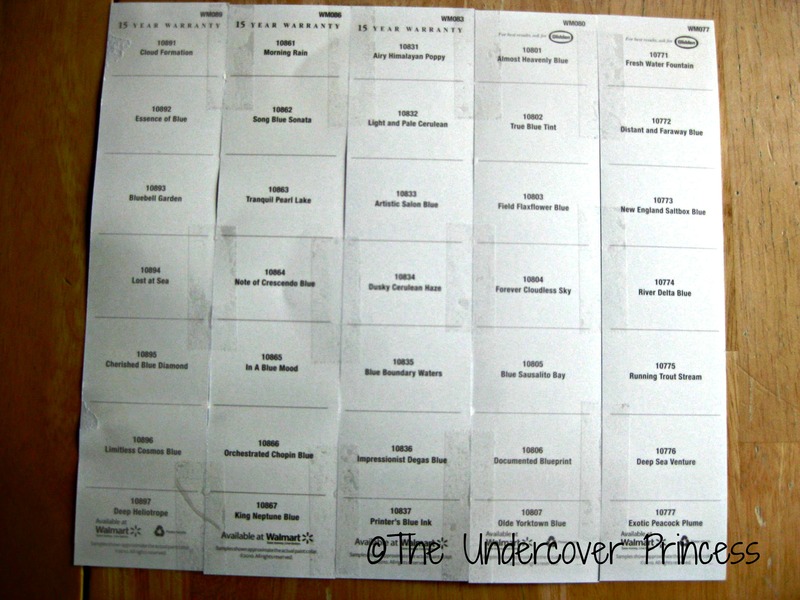 Thank you to Paperless Post for suggesting I dream about my future wedding for this post. I was not compensated in any way. All thoughts and opinions are my own. When I was growing up, I had big dreams about the kind of career I wanted – I was going to be an astronaut doctor who ran down the halls fixing computers. My creativity knew no limits even as a child. Don’t ask me how this particular occupation was born because I honestly don’t know. I have a feeling I took all the things that interested me at the time and mixed them together and came up with something awesome! Sadly, I did not grow up to do any of those things – I don’t love science or math enough to have survived all the education required to become an astronaut, the human body makes me squirm so doctoring was out (fun fact though, I did work at a hospital for three years in a communications role!) and finally, I’ll leave all the computer fixing to my dad, my favorite go-to IT guy! So where did my career path lead me in life – I have a degree in advertising and have spent 4 years in various public relations and media specialist roles. My typical job responsibilities have included writing press releases, graphic design for ads/billboards/marketing materials, helping with event planning and serving as the contact person where the media is concerned. No two days are ever the same which is nice, but I am beginning to feel burned out. For four years I have worked in one kind of medical setting or another and it’s just not something that interests me or that I am passionate about. I don’t wake up excited to go to work and it’s recently got me thinking about what I really want to do – what my dream job today would be…. There’s a popular quote that goes by ancient Chinese sage Confucius that goes “Choose a job you love, and you will never have to work a day in your life.” Sounds simple enough. I love to read and write. I enjoy editing and thinking about word placement and arrangements. My idea of a good time is getting lost in a book, really lost to the point I don’t know what’s happening in the world around me. According to Wikipedia, there’s such a thing as a beta reader, “a non-professional reader who reads a written work, generally fiction, with the intent of looking over the material to find and improve elements such as grammar and spelling, as well as suggestions to improve the story, its characters, or its setting. Beta reading is typically done before the story is released for public consumption.” After some research though, it turns out most beta readers don’t get paid, they just read for the love of reading. I’d be okay with that, I’m always on the hunt for new books to sink my teeth into. So back to my dream job, maybe its an editor. I love reading as I’ve already pointed out, and I enjoy writing, hence my blog, and I’ve been editing my sisters’ papers since they were high school freshmen. It would be pretty cool to be paid to rearrange sentences and replace words with stronger ones. Not to mention, it would be nice holding the always feared red pen for once – so much power in that little tool. But there would also be that satisfaction that I helped improve someone’s writing, and that has always brought me joy. I love being able to help people better express their thoughts and ideas in writing. Over the years many people have told me I have a way with words, may it’s time to embrace this unique talent! The only problem I can foresee is there aren’t many editors in my little neck of the woods in mid-west USA, and I’m not sure I want to move far, far away from my family to be an editor. I’ll have to look into this some more, wouldn’t it be great if there was an online company or a little publication I don’t know about close-by?! That would be amazing – where can I apply, I have my resume ready to go! On the flip side, there’s another career path I wouldn’t mind having, that of a Cosmetologist. WIthin the last few years, I have become so interested in learning new hairstyles and mostly trying them out on myself! It’s amazing how many ways there are to braid, pin, curl, twist and part hair! The creativity is literally endless and I love that! I began posting my creations on Facebook and my friends and family were amazed with what I could do after watching a tutorial. My little sisters have even let me style their hair on occasion – which I absolutely love doing! As you can see, I love trying different things with my hair, from heatless curls to braids and updos! (Wish I had more of a variety to show you, but these were the best ones I could find on my phone!) How much fun would it be to do other’s hair all the time?! Of course I know I’d need to learn to cut, style, color and shave, but hey, that sounds exciting! Learning to do manicures and pedicures sounds fun, too! Every time I go to have my hair refreshed, those ladies just seem to be having so much fun catching up on news from the community and building relationships with their regulars. What’s not to love?! What career path do you wish you’d taken?! Or are you already living your dream job? My fitness and health are my number one priority – I will honor this by committing to loving my body as it is today, while pushing myself to become stronger, trimmer, and healthier tomorrow so that I can be around for a very long time. I will honor my priority when I feel love for myself and remember to use only words and phrases that will build up my self-esteem and confidence. I will remember that my body is just the shell where I live – it doesn’t define me or limit my potential; however it does house my soul and my true self. I will commit to exercising 30 minutes a day, 3 days a week and will come as close as possible to the recommended 10,000 steps per day as I can. I will also be more mindful of how late I am staying up so that my body has a chance to fully recharge and recover during a full 8 hours of sleep each night. I will be more aware of the food I am putting into my body and why – am I really hungry or am I thirsty, tired, stressed, anxious or mad? I will choose water more often than ice tea and juice, even if that means drinking it at room temperature. I will do better at counting my calories and using the resources available to me (i.e. My Fitness Pal and my Jawbone Up 24 app). I will not feel guilty when I turn down my coworkers offer to order out for lunch or feel obligated to eat a cookie or something sweet they brought in to share. I will limit my time reading for pleasure or watching TV so I can fit in my workouts. I promise myself I will notice one thing I love, that is beautiful about my body everyday. I will never talk negatively when clothes don’t fit right or if I have yet to master a simple yoga pose. I will stop comparing my body to my friends, family members and celebrities as we are all at a different place on the fitness journey. I will work to not punish myself for “bad days” or “slip-up days”. I will acknowledge that I was not trying at a 100% and will start again tomorrow; I will get up and try again. Failure is not an option and is not in my vocabulary any longer. I will know I am perfectly committed to my fitness and health when I feel pride and joy in my progress and power in my choices. I will see a girl who is confident, radiant, self-assured of her place in the world and a beautiful person inside and out. I will have a smaller dress size and a smile that lights up the room! I will have energy to spare, smaller body measurements, healthy lab levels, control over my emotional eating, knowledge of how to live a healthier lifestyle, the desire to share that knowledge with others and the piece of mind that my outside finally matches the beauty I’ve always felt on the inside. I will hear the compliments of people who’ve noticed my progress and want to know how I’ve done it, I will hear my breathing is easier, no wheezing in my lungs and my heart won’t be pumping as hard. I will hear the roar of the crowds cheering when I cross the finish line of future races! I will know that I have done my best and that I gave it my all. I will know that I am worth spending time on. I will know strength, power, and freedom and have a clear understanding that I am in control of my life and that I have the power to change the things I don’t like with a little hard work and determination. **Are you wondering how I came up with my personalized priority statement? Interested in creating one for yourself? Watch the same videos I did by Chalene Johnson – I’ve made it very easy for you to find the videos on this playlist! If you’re interested in following along with the worksheet she mentions, here it is: SSS Life Balance Worksheet! I hope that you’ll take what she has to say seriously to heart, I have a better understanding of the things I need to change and focus on in my own life now! That voice that sounds like my voice, but isn’t. That voice which remembers every failure and every mistake and every disappointment and lives to remind you of those times over and over and over again. Most of the time I have no trouble tuning that awful voice out. I know what it’s telling me isn’t true. I know my life has a greater purpose that I haven’t discovered yet. I know I’m not worthless, but sometimes when my world starts shaking and it feels like my foundation is crumbling, I sometimes forget. I find myself comparing my “lack of accomplishments” to the apparent abounding success of others, especial those with whom I am on less than friendly terms with. I find myself asking why it comes so easy to these individuals, why was it handed to them when I’ve been working long and hard with no results, what makes them better than me? It was on one such occasion this afternoon when I stumbled upon the following story on the blog Catalyst Quotes. Hands started going up. He said, ‘I’m going to give this $20 bill to one of you, but first let me do this.’ He proceeded to crumple up the bill. He then asked, ‘Who still wants it?’ Still the hands were up in the air. ‘Well,’ he replied, ‘what if I do this?’ He dropped it on the ground and started to grind it into the floor, so now the bill was not only crumpled, but also dirty. ‘Now who still wants it?’ Still the hands went into the air. And that led me on the hunt for other uplifting reminders. Yes, I am not perfect. There are times I will make mistakes or fail or just not be within reach of my dream. I don’t know what God has planned for my tomorrows yet, but I’m working on trusting him and his timing. I am a unique, special and loved individual. There’s only one me in the entire world, and I’m striving everyday to be the best version of her I can. Sometimes it’s a struggle not to give in to the taunting of the voice who would have me believe otherwise, but in a way I’m glad it’s there pushing me to better myself and prove it wrong. Anyone who knows me knows I love a challenge and the chance to prove someone wrong, even if it is just that nasty self-doubting voice in my head. It’s been a very long time since I’ve A.) been on Pinterest and B.) felt like doing anything crafty. But that all changed today. For a few days now I have been trying to come up with a birthday gift for the special guy in my life when I remembered a pin I had found a few months ago and decided it was worth a try! So here we go, it was actually pretty easy! 1. Start off by taping the paint chips together. For my size frame, it took 5 paint samples across. 2. 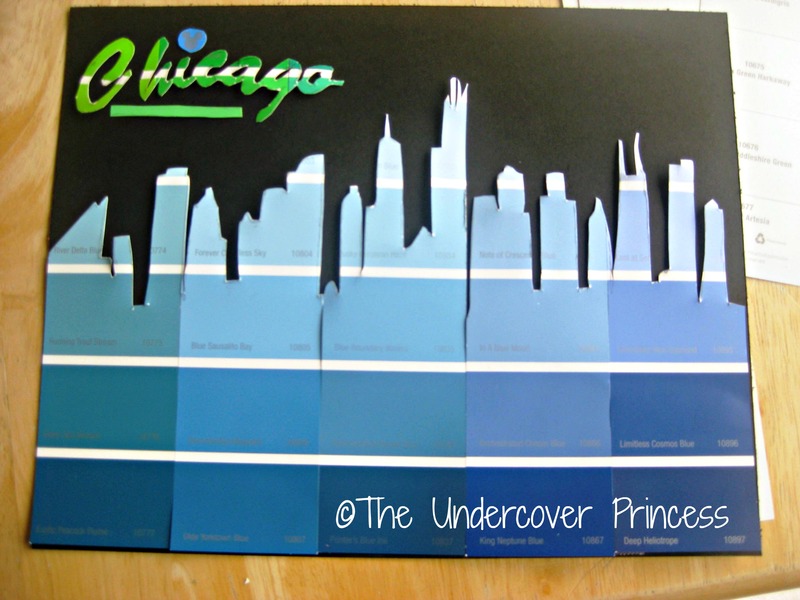 Cut out your skyline and lightly trace it onto the front of your paint chips. 3. 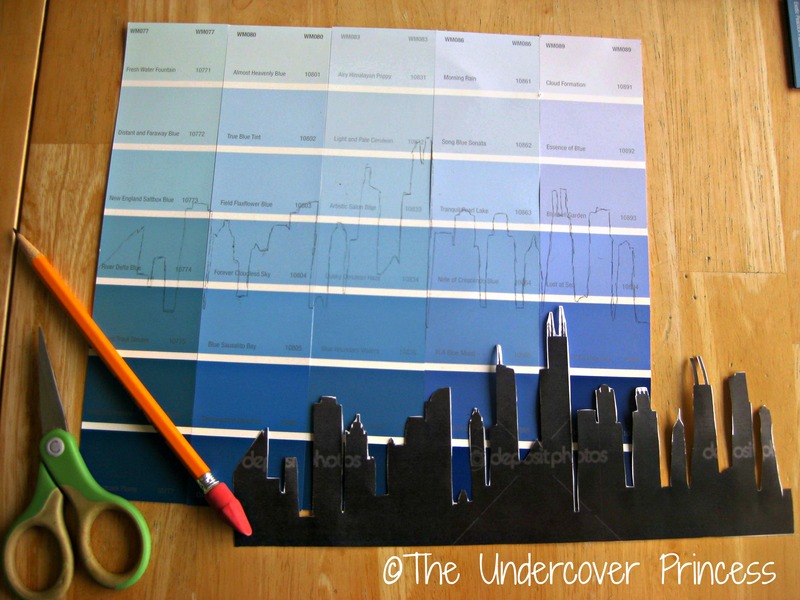 Carefully cut out your paint chip skyline. I had to switch to use very small scissors so I could get some of the details. 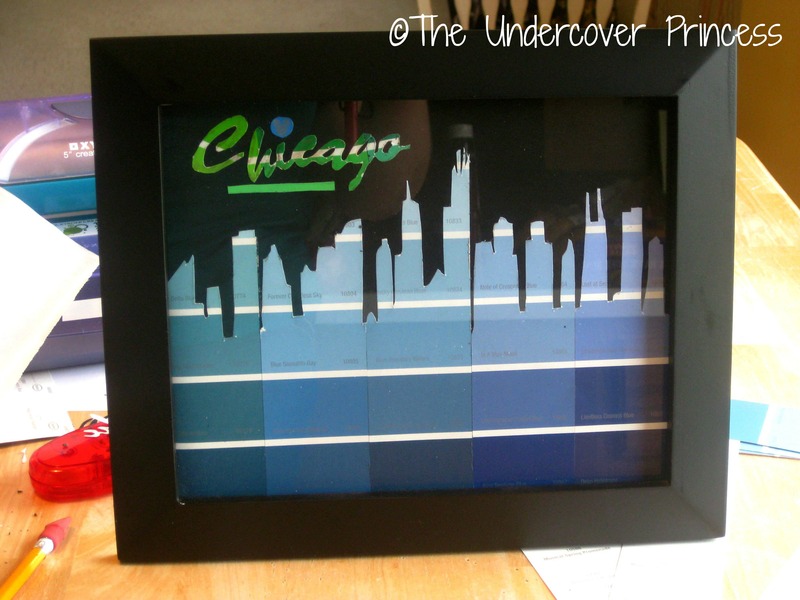 I also added the Chicago scrip to add some green and a special hidden Mickey (look at the dot on the i)! Then glue it all down onto a solid color background. 4. Place your new masterpiece into its frame and enjoy! In all, I really liked how this turned out! And it didn’t take long at all, about an hour total — I probably could have worked faster if I hadn’t also been watching ABC Family’s Pretty Little Liars from last night! This is a project I could see myself recreating many, many times! Many next time I’ll try something with Disney or some of the different places I’ve traveled to on vacation. 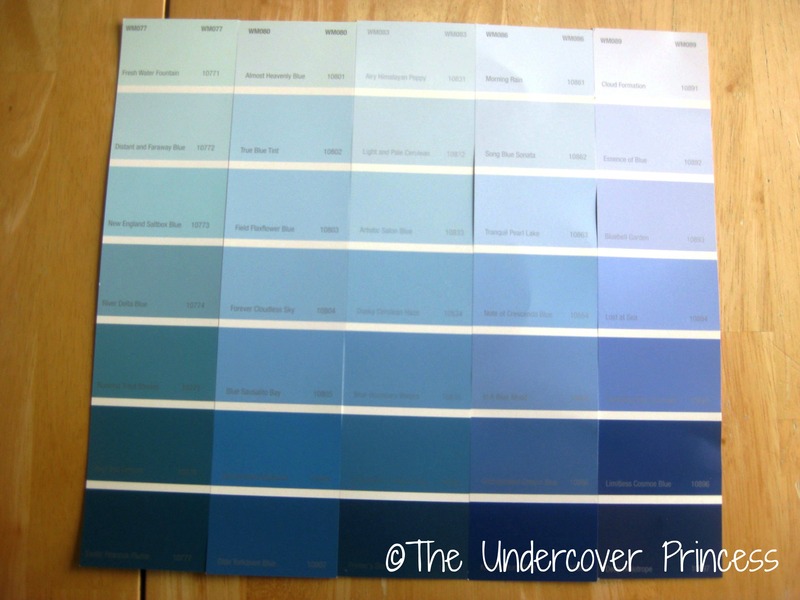 The possibilities are endless and the paint samples are many! Happy crafting my friends! 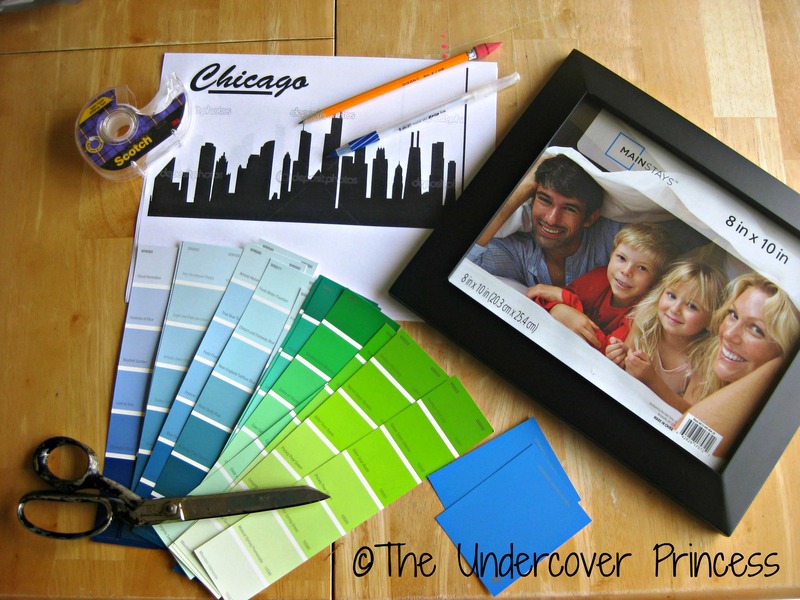 Let me know if you decide to make a paint chip skyline of your own, I’d love to know how it turns out!